Situated in Vlaha, Pensiune Casa Barolo offers a garden, an indoor swimming pool and free private parking. Free WiFi is available in the business centre, and a bus stop is 500 metres away. 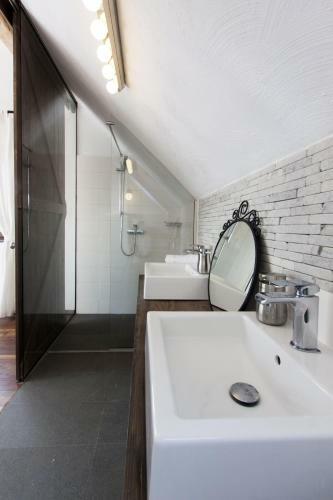 The units at the Casa Barolo come with a private bathroom with a shower, a flat-screen TV with satellite channels and free toiletries. Hairdryers and bathrobes are also provided. Guests can take advantage of a free wellness area, comprising a steam bath and a sauna. Massages are available on request. Breakfast is served every morning at the Casa Barolo and dinner can be enjoyed at the on-site à-la-carte restaurant. A grocery shop is 100 metres away. Cluj Train Station is a 20-minute drive away. This villa has a satellite TV and bathrobe. This package includes access to the interior pool, exterior sauna, exterior traditional wooden bath, relaxation area, conference room, all covering a surface of 800 square metres in a quiet area.